Current as of 8/8/2018 – yet, a few spaces still being listed. 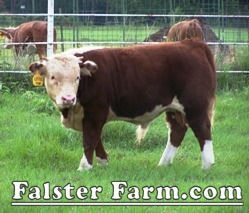 Falster Farm does not sell cull cows, we have some, but those sell as steers, delicious Honestly Grass-fed Beef™. 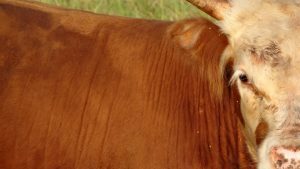 Our time honored method is Private Treaty sales, which means we have evaluated these animals and offer them for sale based on our considered value. There are however, package prices, and other’s offers considered as a part of the evaluation process. Please don’t hesitate to make an offer. AND, with us, no order is too large or too small. Each customer receives our undivided attention and respect for their wants. 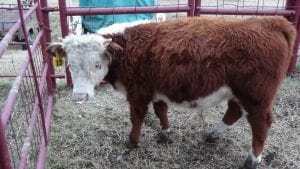 Calved April 17, 2017, to KNF MISS ENID, this youngster is owned by a Swiss couple as an investment. 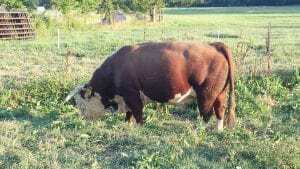 He is a gem, standing 36″ tall at the hip as a yearling: weighing 370#. 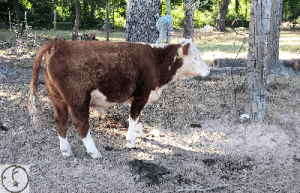 Calved September 12, 2017 (an Embryo Transplant) to the Original TEXAS LILLY and the original MB MARTIN LUTHER, literally here is the “chip off the old block” of Hereford Perfection. 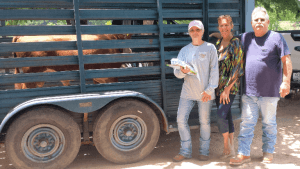 Standing 37″ tall at the hip as a yearling: weighing 380#. Excellent top and bottom line, with a rear end hard to match in the Hereford world. 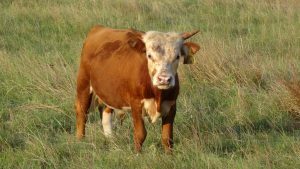 Mike H. comes from Arkansas to rent a registered Mini Hereford Bull every year. KNF CAPTAIN MIKE in trailer, ready for getting the job done.